So it is Germany versus Argentina in the 2014 World Cup! After Germany's brutal trashing of Brazil, I got my money on the black, red and yellows (although I am also rooting for Argentina because my boss is a huge fan and might declare holiday for the company if they win). In anticipation of the finals, a huge gathering between my friends and I are in the works and I found myself stuck with chips and dips duty. To my defense, I wasn't present when the delegation of tasks were given out so yeah, resulting with me stuck with chips and dips duty. 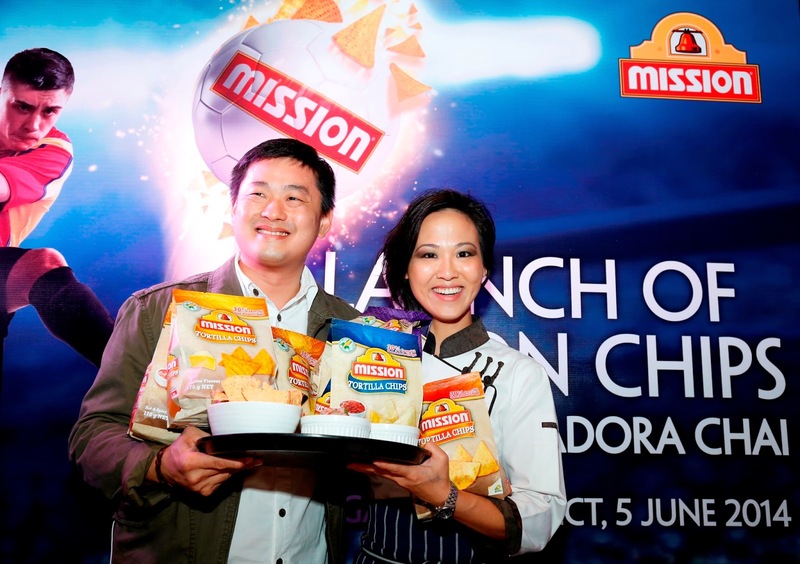 Just in time for the start of the FIFA World Cup, Mission Chips has arrived in Malaysia offering authentic tortilla chips made from 100% real corn. Because it uses about 30% less oil than the usual potato chips, Mission Chips is definitely a healthier option for snacking. The chips are also cholesterol-free with zero grams trans fat per serving. There are six flavours to pick from; Cheese, Tomato, Hot & Spice, Butter & Garlic, Barbeque and Original flavour. To demonstrate how their chips can be paired with dips, Mission Chips have enlisted the help of Chef Isadora Chai of Bistro à Table to come with six different dips with a local twist. With recipes, ingredients and chips provided by Mission Chips, I set about trying out the easiest of the recipes; Curried Cream Cheese dip in preparation for the FIFA finale party. It doesn't require much, only four ingredients and I don't need to do any pre-cooking preparation. This recipe is ideal if you want something fuss-free and with minimal cleaning up to do after. Mix the ingredients together and adjust the heat of the curry powder to your preference. I emptied the curry powder pack into the mix for a spicier kick. Verdict: Well, the feedback I got from my guinea pigs colleagues varied with some telling me that it was delicious with the chips and one telling me that its spiciness burnt the back of her throat. Personally, I like it and I think the chips (Original flavoured) helped balance out the spiciness nicely. So give this recipe a shot and treat your friends to some delicious chips and dips this weekend and Monday morning. Psst, you can even tell your friends that you made it yourself. wow.. looks yummy hehe.. usually I dip Thai Chili sauce lol. hehe.. back to copy recipe :D opps forgot buy lemon..